Actually there were two brief showers during my visit to this area of Galway. Claddagh is an area close to the centre of Galway city, where the River Corrib meets Galway Bay. It was a fishing village, just outside the old city walls. 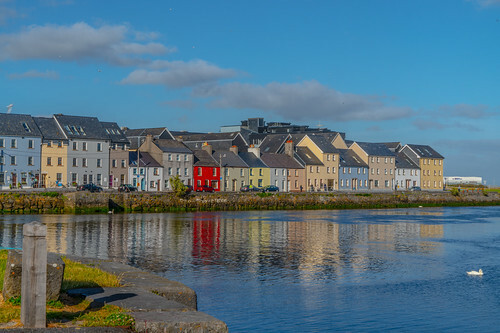 It is just across the river from the Spanish Arch, which was the location of regular fish markets where the locals supplied the city with seafood as recently as the end of the 19th century. People have been gathering seafood and fishing from the area for millennia. It is one of the oldest former fishing villages in Ireland - its existence having been recorded since the arrival of Christianity in the 5th century. During the 19th century the Claddagh attracted many visitors, including writers who spread its fame. The original village of thatched cottages was razed in the 1930s and replaced by a council-housing scheme.